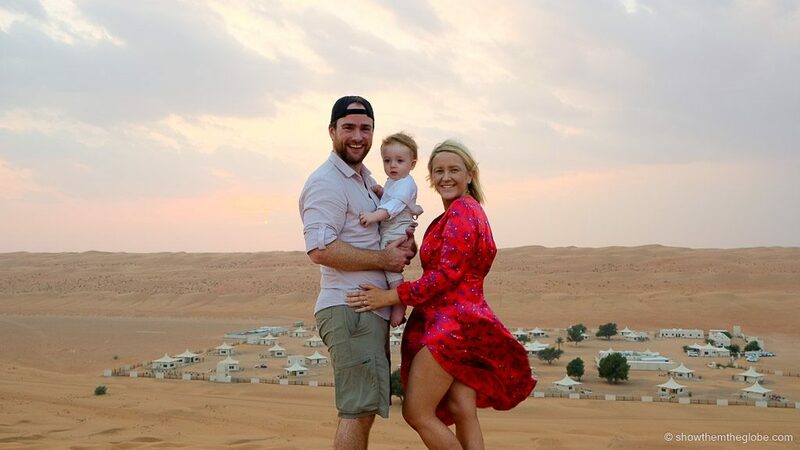 On our recent flights from Dublin to Tokyo via Dubai we flew Emirates economy with our baby, J, who was 10 months old at the time. 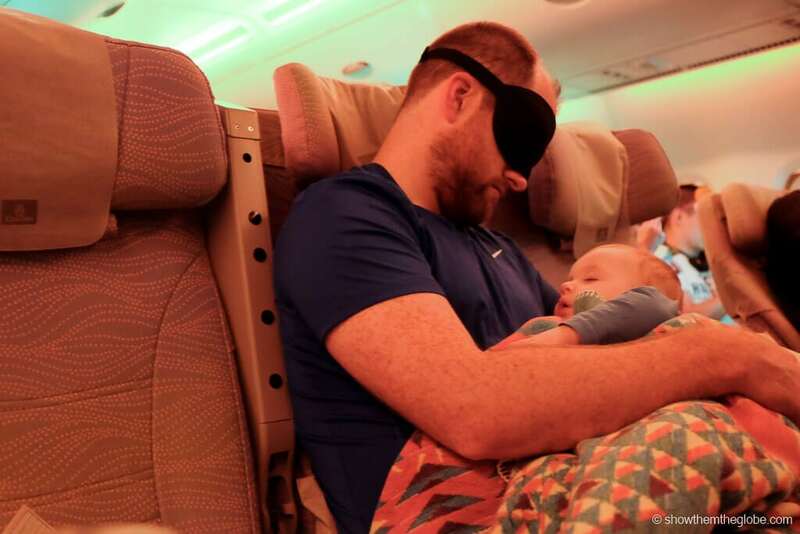 From our pre-flight dealings to the onboard experience here’s the lowdown on our Emirates flights with a baby or lap infant in tow! Lap infant or own seat: only front facing car seats are permitted on Emirates flights and infants who have their own seat are not allocated bassinet seats (although they can be purchased at an additional cost). We opted to take J as a lap infant as we prefer a bassinet row and we needed to bring his rear-facing car seat for car journeys. Fare: Lap infants are charged 10% of an adult fare. Bassinet availability: bassinets are available in Emirates economy cabins and their location varies depending on the aircraft. Seat selection: after purchasing our flights online we rang the Emirates helpline and booked our bassinet seats with the agent on the phone. 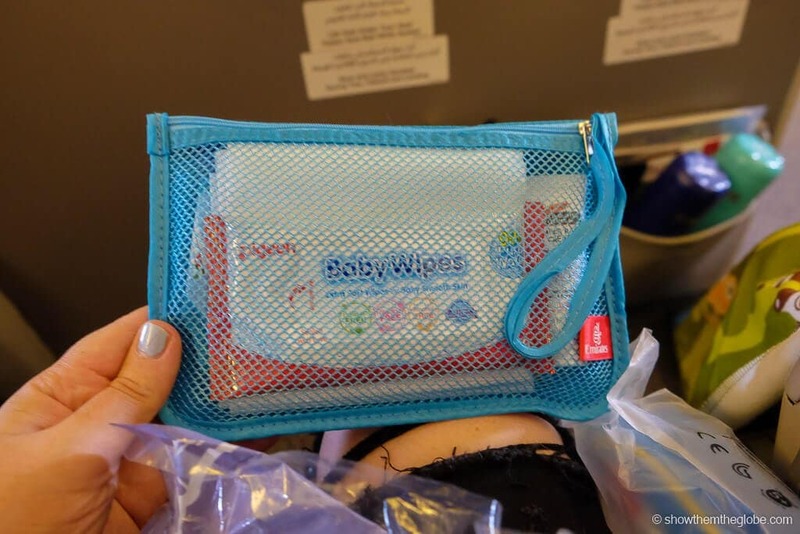 We were able to book the most basic economy fare as travelling with an infant meant seat selection was complimentary and the baggage allowance was the same. Emirates flying with a baby tip: Although J is reaching the maximum size for some of the airline bassinets we still find the bassinet row invaluable for both the extra space and the lack of seats in front meaning no one can recline which would be difficult to manage when holding a baby. Baggage: infants are allowed one cabin bag weighing up to 5kg for in-flight necessities as well as one fully collapsible stroller or a carrycot as a carry on item providing there is cabin space available. We took a baby bag as J’s cabin piece and we took his stroller, a cabin friendly BabyZen Yoyo, as our second piece. Piece concept: flights from Canada, North America, Central America, South America and Africa. Infants are permitted one extra piece of checked baggage up to 23 kilograms. Weight concept: our luggage allowance for our flights to Tokyo was based on the weight concept (we had 30kg each). We were permitted an extra 10kg for an infant. Emirates flying with a baby tip: we priced additional checked luggage and it was expensive so we stuck to the basic limits which we found generous. We were thankful for the generous luggage allowance for our three month trip! 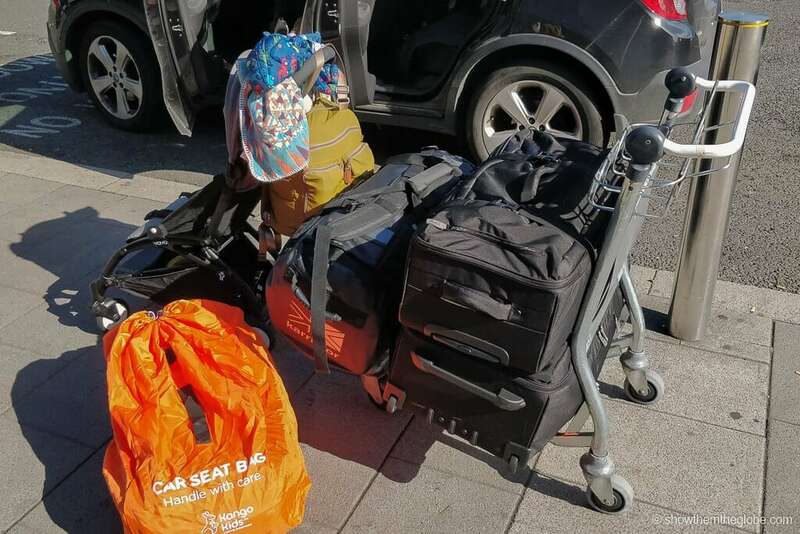 Having checked in online, we dropped our bags at the Emirates counter in Dublin and took our car seat to the oversized baggage counter. Emirates flying with a baby tip: we always use a car seat cover to protect our car seat in the hold. Passengers with infants are called to board after priority passengers (first/business class and Emirates frequent flyers). It was invaluable having an extra few minutes to store our luggage and settle J before general boarding began. 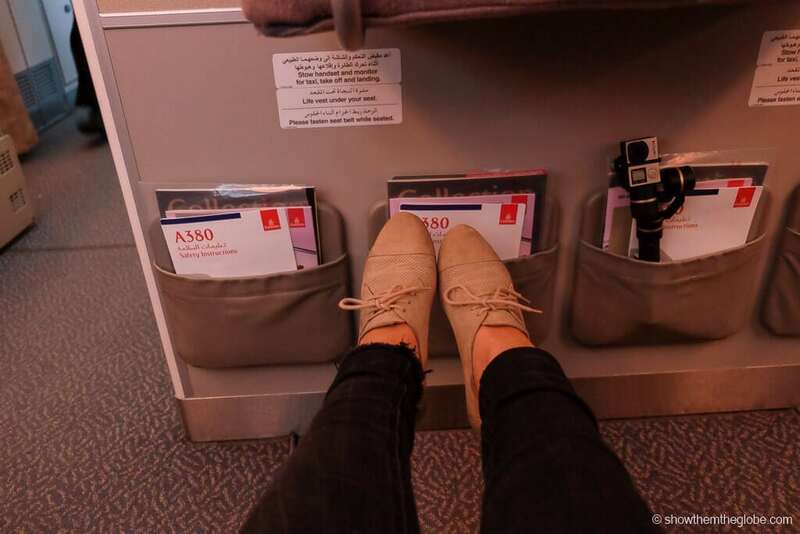 As we had a connecting flight through Dubai we flew on both a Boeing 777-300ER and an Airbus A380-800/Dreamliner. We flew on a two-class Boeing 777 from Dublin to Dubai. The aircraft has three sets of bassinet rows in economy which are located in rows 8, 23 and 37. We chose row 37 as they are behind the galley rather than the bathrooms which are located in front of row 23. Row 8 is our preferred choice but it wasn’t available when we reserved and didn’t open up before we flew. Seat width and legroom: The bassinet seats had a little extra legroom but this came at the expense of seat width: the tray table is stored in the arm of the seat reducing the seat width. The armrests are also fixed. We’re not especially wide but the seats were uncomfortably narrow and, from what we could see across our row, all the adult passengers were finding it a tight fit. Seat location: The back cabin of the plane was really noisy and the galley was extremely busy throughout the duration of the flight. This may have been in part due to a run on the bar when the entertainment system and the ability to switch off personal lights failed but the cabin was bright, chaotic and not enjoyable. It was also difficult to walk around with the baby for a break as there wasn’t really anywhere to go. The aisles were busy and the galley crowded so we stuck to our seat outside of toilet breaks. The bassinet: At 10 months we weren’t expecting J to fit in the bassinet but the 777 bassinet was generously portioned and he fit comfortably in terms of length, width and weight. He spent a few hours napping in the bassinet and another little while sitting up playing while we made sure he didn’t try and escape! The bassinet was also great for storing toys, making bottles and generally just having a little extra storage when we weren’t using it for J. We flew on a two deck, three class Airbus A380 between Dubai and Tokyo. The aircraft has four sets of bassinet rows in economy which are located around rows 46, 54, 67 and 82. We chose the middle of row 46 as these seats are located at the front of the lower deck and are nestled behind the stairs leading to the upper deck with first and business class seating. We were fortunate to have the four middle seats to ourselves and the crew were kind enough to let us know before take off that we could utilise the four seats. Seat width and legroom: The bassinet seats had significant extra legroom and, although still slightly narrower, were much more comfortable. The two middle seats of the four seater had movable armrests. 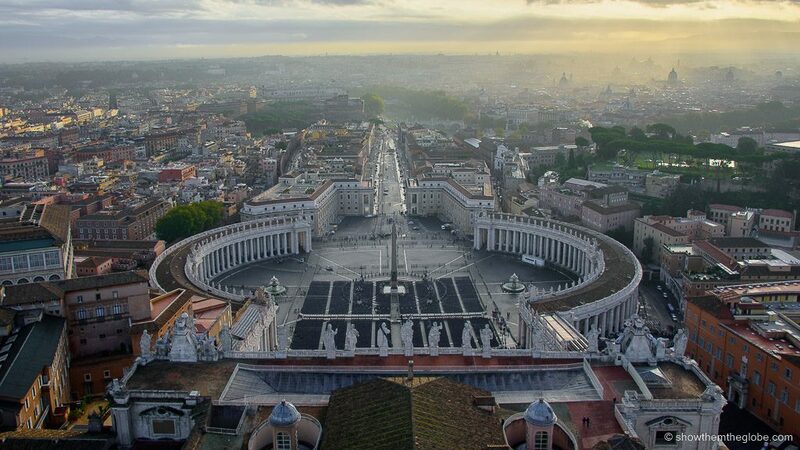 Seat location: what a difference a flight makes! 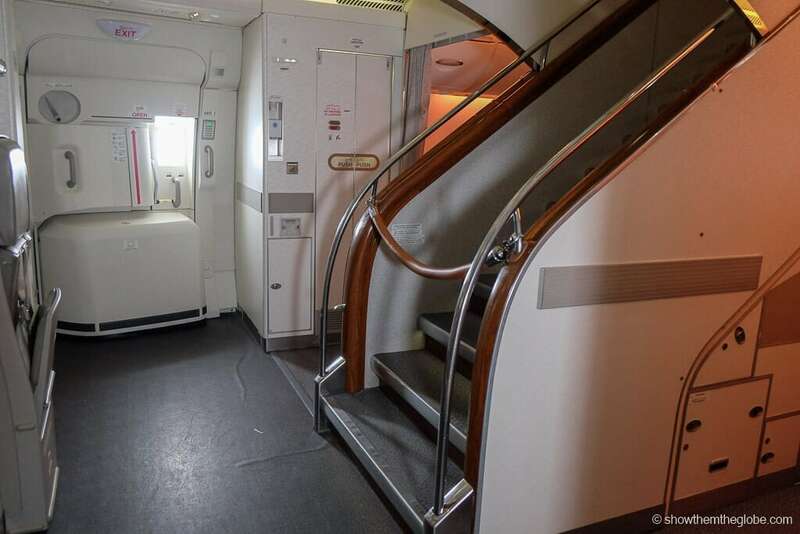 The front row of the A380 is nestled under the stairs and the toilets are located a good distance in front. There is lots of space to walk around the stairs whenever you need a walk. The front cabin was very quiet and, given it was a night flight, most of the cabin slept for the majority of the flight. 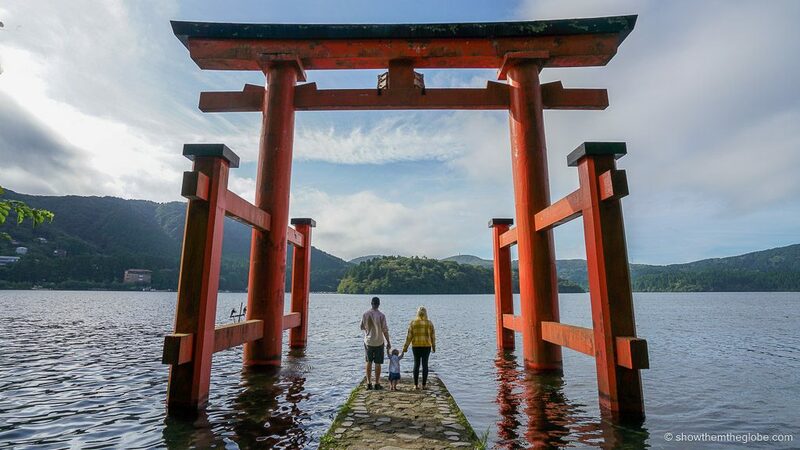 We were lucky that J joined them for 7 of the 10 hours it took to get to Tokyo! The A380 has some pacing space! The bassinet: The A380 bassinet was smaller than the Boeing 777 bassinet we’d used on the first flight and it was too tight a squeeze for J. 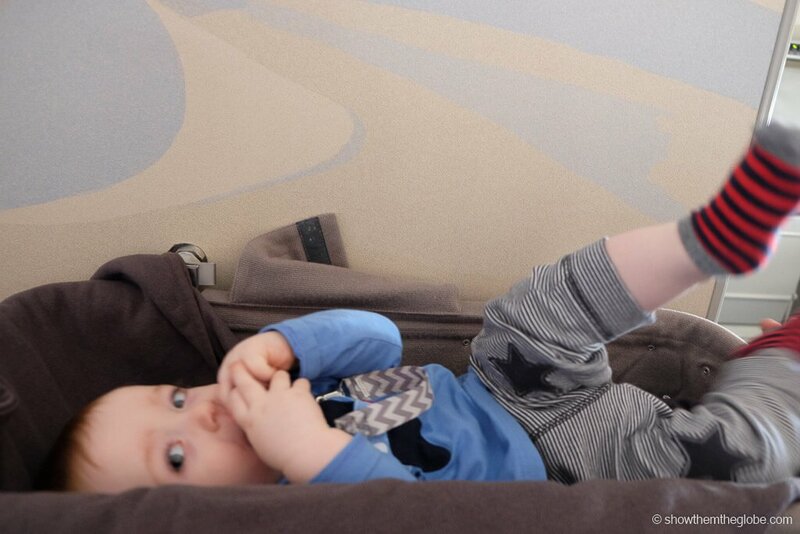 He is quite a tall baby and was too long for the bassinet on the A380. Thankfully, as we had 4 seats, Dave was able to keep J comfortable and he slept for 7 hours. The crew offered us Ella’s Kitchen pouches for J but we didn’t use them as the flavours weren’t suitable for his diet. We also had our own Ella’s Kitchen pouches and the crew were happy to heat them whenever we needed. As J was only ten months when we flew we took our own sterile water and he didn’t have anything to drink on board. There was a changing table in one of the four bathrooms beside our seat on the A380 and in the bathroom beside us on the Boeing 777. J was given a seat belt extension which attached to the standard seatbelt and was required to use it during take-off, landing and any time the seat belt sign came on. 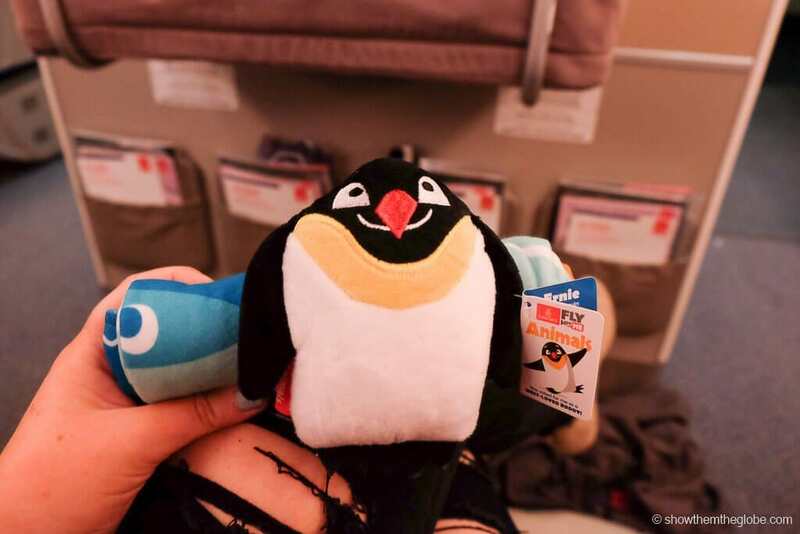 J was given a children gift bag on both flights and it included a little animal themed backpack, stickers and teddies. 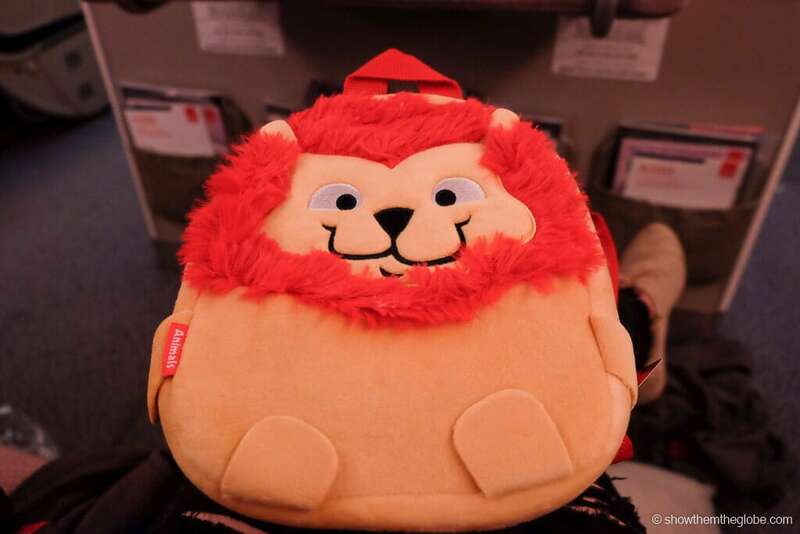 He was delighted to have some extra toys and still loves his little lion backpack! 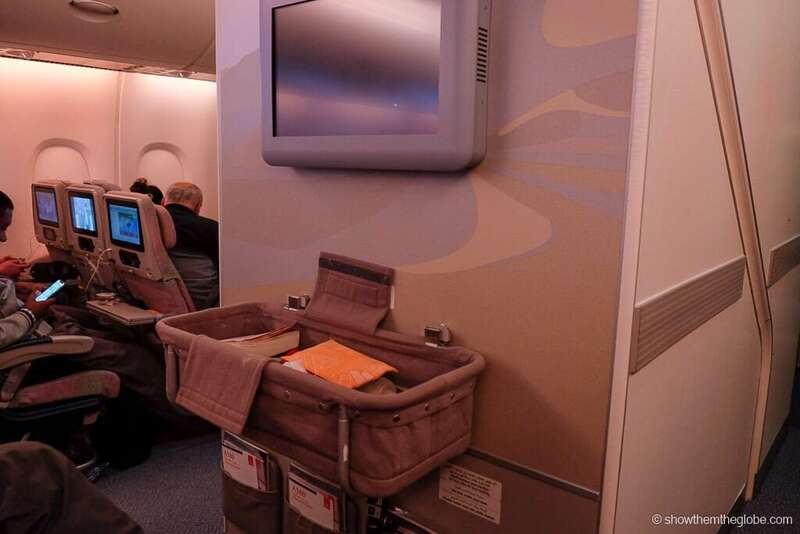 With pre-boarding, bassinet rows and complimentary seat selection, Emirates offers excellent service for those travelling with babies and lap infants. We much preferred the A380 to our flight on the Boeing 777 due to the slightly wider seats and having room to walk around with J when we needed a break. The crew were really friendly and did everything they could to help on both flights and always had a huge smile and a friendly interaction with J whenever he was awake. Thankfully, J was a star on both legs of the trip and he got lots of compliments from the crew with one describing him as the best baby she’d had on board. Who knows how long that will continue but for now he’s a pleasure to travel with! How tall was J at that time (for bassinet fit)? Hi, I’m not sure what height J was! He was 10 months when we left and is a pretty tall little guy for his age.